Here you will find our export strategy for the worldwide exploitation of our reseach results and our dissemination materials. In order to transfer knowledge coming from a research project to the different target groups, MULTI-ReUse relies on the interactive touchtable. Here is a short film (in German) about it. This German paper has been published in the gwf-Wasser-Abwasser and discusses the EU proposal. It has been co-written by scientists from the MULTI-ReUse project. 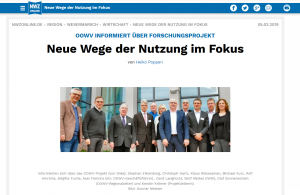 The Oldenburgisch-Ostfriesische Wasserverband (OOWV) introduced the MULTI-ReUse concept and different concepts for water reuse to the citizens of the regions. Here you can find an article from a German newspapaper about it. The event was also mentioned in the press reviews of the DVGW. 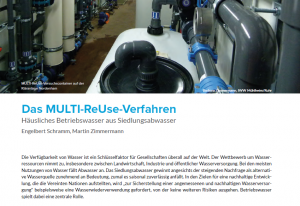 An article about the MULTI-ReUse procedures has been published in the German magazine fbr-Wasserspiegel 2/18. What exactly is MULTI-ReUse researching? And why? The imagefilm (in German) summarizes the research project and outcomes in an easily understandable manner. You also can watch it on Youtube. Water recycling is a good option for water scarce areas to allow and maintain industrial and agricultural production and to protect existing ecosystems. This info graphic shows which fields of application are suitable for water recycling or water reuse. 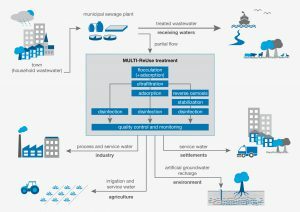 For the application fields industry, agriculture, urban water management and managed aquifer recharge the project MULTI-Reuse researches usage requirements and potential markets. The graphic also gives a rough overview of the treatment procedures that are being tested within the MULTI-ReUse project at our pilot plant in Nordenham. Three procedure chains, circling around ultrafiltration, reverse osmosis and adsorption, produce three different kinds of service water in the end. 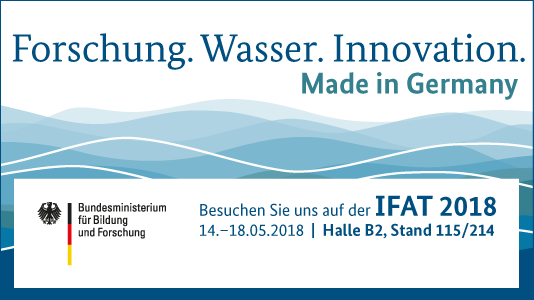 MULTI-ReUse at BMBF-Stand - IFAT 2018.